Michael Korman, wife Elizabeth, son Dillon, 8, and daughter Tatiana, 14, checked in at go! airline yesterday. The family was off to celebrate Dillon's eighth birthday on Maui. Eleven-year-old Taylor Anama, wearing a blue hooded sweatshirt, stood at the top of the plane's stairwell for a few moments, squinting into the morning sun before making her way down to the tarmac. And with go! officials and the media looking on, the new interisland airline's first passenger officially had landed. It was a whirlwind day for two of Hawaii's interisland carriers yesterday. As go! 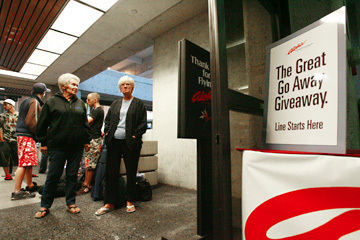 was celebrating its successful glitch-free debut at the Honolulu Airport commuter terminal and neighbor island airports, Aloha Airlines was handling 1,600 people statewide who showed up for a free giveaway of 1,000 round-trip tickets. "I think the day went really flawlessly, certainly in consideration it was our first day of operations," said Jonathan Ornstein, chairman and chief executive of Mesa Air Group Inc., the Phoenix-based parent of go! Ornstein said he and go! 's crew were touched by comments from some of the passengers. "Business was great," said Ornstein, noting that most of the flights on the 50-seat Bombardier CRJ-200s were more than 90 percent full. "But hearing the passengers say that they were traveling for the first time in years interisland to visit their friends and family makes you feel pretty good. I think it really affected me and affected other people who heard it. It was an incredible experience for me today." At least one go! passenger, Marilou Nieveras, who had taken advantage of the promotional $39 one-way fares, was hoping to score with both airlines. Nieveras, who arrived on go! 's first Maui flight for her niece's preschool graduation, said as she was picking up her baggage that she hoped to make it over to the interisland terminal in time to get a free round-trip ticket. "It's fun to be part of the first group of people that flew on the first flight," Nieveras said. "It's wonderful for the passengers." Asked if she would fly on go! again, she exclaimed, "Sure. Every time their price is better, we'll go. We'll go!" The first arriving go! flight, which came from Lihue, Kauai, had 44 of its 50 seats filled. "It was great and the attendant was really sweet," said Anama, who attends King Kaumualii Elementary School on Kauai. "I had a better time on go! than on Hawaiian or Aloha." Maile Hurley, who followed her granddaughter Anama off the first Kauai flight, said she enjoyed flying on go! "It was great and less hassle without a lot of people," Hurley said. "The flight was smooth, and the flight attendant was very gracious. I'm very glad they're here because they'll give Hawaiian and Aloha competition." The Maui flight, which touched down about a minute later, had 46 seats taken. Sisters Caryl Hendershot and Barbara Wise were the first in line to receive free tickets being offered by Aloha Airlines yesterday morning. They had been waiting since 7 p.m. the previous night. Even though go! is using just two of its three Hawaii-based aircraft now, Ornstein said a fourth plane arrived yesterday and might be used for charter work before being put into service later this month. Ornstein said go! has just a few things to fine-tune in its Hawaii operations, such as having lines painted on the tarmac to show passengers where to walk and placing signs, which have been ordered, in front of the planes so people know which aircraft to board. "One of the things that's important is getting their bags delivered quickly, and we timed all our flights, and between the time people left the airplane and got their bags it was 10 minutes or less," he said, giving credit to the outsourced ground handlers, who were hired by Swissport in Honolulu and by United on the neighbor islands. Aloha's freebie giveaways also went smoothly, with about 600 showing up at the interisland terminal at Honolulu Airport and the remainder spread out at four neighbor island terminals. The first two people in line in Honolulu were sisters from Waikiki, Caryl Hendershot and Barbara Wise, who had heard about the giveaway on Thursday's 5 o'clock news and were in line by 7 that night. "We thought it was going to be mobbed, and, in fact, we didn't even think we were going to get tickets," Wise said. "We were prepared to come, count the people and then get back on the bus and go home because we knew there would be 500 people here right away." The tickets in Honolulu were gone about two hours after Aloha began handing them out. Those not able to get tickets in Honolulu and at the various airports were given forms to fill out for a random drawing for 100 round-trip flights. E-mail and letter notifications will be sent out on Monday. "There were remarkably few people unhappy, and those were the ones with children," Aloha spokesman Stu Glauberman said in reference to the airline's restriction that only those 12 and over qualified for the free tickets. One unidentified woman was angrily looking for an Aloha official to vent her case. "I've been here since 1 a.m., I brought eight children with me and I'm (upset)," she said. Scott Ishikawa, spokesman for the state Department of Transportation, said he was pleased with the smoothness of both operations, especially with yesterday being the start of a three-day holiday weekend. "I think things went pretty well today considering the fact we had over 500 people waiting for free tickets, as well as this being the first day for go!," Ishikawa said. "We did work with Aloha Airlines, and they did a good job managing the line. We were initially concerned that the line was going to impede the flow of passenger traffic, but that was not the case." Ishikawa also said parking might be more difficult to get not only this holiday weekend, but throughout the summer. "Our best advice for passengers is to come early to the airport knowing that the fare wars will attract larger crowds," Ishikawa said.